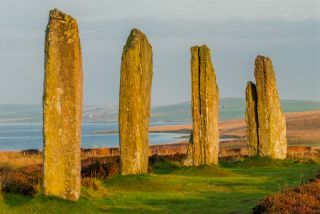 An RSPB nature reserve is located in a spectacular setting beside the Ring of Brodgar stone circle, with Harray Loch on one side and Stenness on the other. This reserve is best for seeing Orkney waders, curlews, snipe, lapwings, dunlins, redshanks and oystercatchers. Best in summer. Summer brings out 7 different species of wading birds and 8 species of ducks taking advantage of the wetland habitat. Look for great yellow bumblebees around patches of wildflowers. The bumblebees are still present in autumn when wading birds can be seen in large numbers near the shore. Winter is best for farmland birds like lapwings and twites, while spring brings a wonderful mix of species Look for skylarks, ducks, and wading birds in courtship displays, and owls, hen harriers, and merlins flying low over the reserve while they search for prey on the ground. There is no entry fee and the reserve is open at any time. There are also regular guided walks available from RSPB staff, aimed at families and taking in mostly even, level paths. Access is easy, and the Ring of Brodgar stone circle is well signposted. Location: On the B9055 2 miles north of Stenness. The best place to park is at the Ring of Brodgar parking lot. Nearby accommodation is calculated 'as the crow flies' from Brodgar RSPB. 'Nearest' may involve a long drive up and down glens or, if you are near the coast, may include a ferry ride! Please check the property map to make sure the location is right for you.